Place a layer of cling film on your work surface and pop the chicken fillets on top. Cover with another piece of cling film and, using a rolling pin, ask your child to bash the chicken until it is 2-3mm thick. Mix together the breadcrumbs and Parmesan in a shallow bowl, then ask your child to toss the chicken in the mixture to completely coat in the crumbs. Put the chicken on a plate and chill in the fridge until ready to eat if you’re not cooking them straight away. 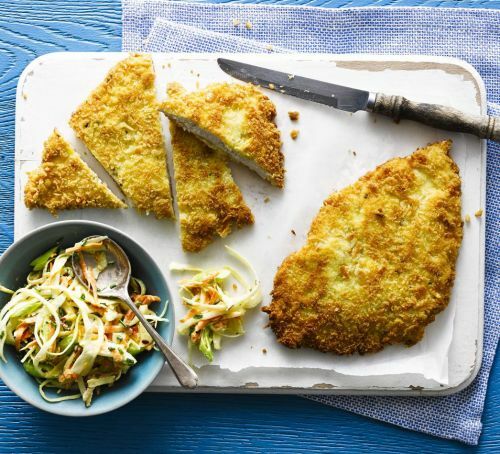 Heat the oil in a large frying pan over a fairly high heat and cook the chicken schnitzels two at a time. Sizzle them for 2-3 mins each side until completely golden, then lift out onto kitchen paper to drain. You can keep them warm in a low oven while you cook the rest. Serve with the coleslaw.